This could tide you over to Fallout 76. 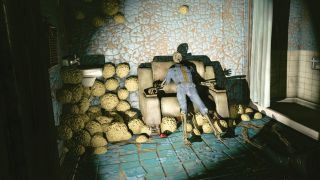 Located among the stormy radioactive wastes of the Glowing Sea, Vault 117 was once teeming with life, but now lies rotting, irradiated and empty. Well, almost. Some of its residents have transformed into mindless ghouls, cursed to endlessly roam the shadowy corridors of their former home. But what happened to them? The Lost Vault was created by Spiffyskytrooper, who is perhaps best known for his acclaimed Fallout 4 landscape mods. Regrowth Overhaul fills the Commonwealth with lush flora, while Dustbowl Overhaul does the opposite, transforming the map into a desolate and arid desert. But this mod is something else entirely, being an atmospheric dungeon dive set in a sprawling ghoul-filled Vault. After downloading The Lost Vault from www.nexusmods.com, drop the files into your Fallout 4 installation directory, then activate it via the in-game mod menu. This will make the entrance to Vault 117 discoverable at the bottom-left of the map. Just make sure you have the Vault-Tec Workshop DLC or it won’t work. I arrive at the Vault and see the entrance looming through the sickly yellow haze of the Glowing Sea. Skeletons litter the exterior and I notice a sign with ‘WE HAVE CHILDREN’ scrawled on it by some desperate parent who didn’t make it inside before the bombs fell. This sets the tone for The Lost Vault, which is unrelentingly bleak. Inside, the Vault has been plunged into almost complete darkness, forcing me to use the light on my Pip-Boy to navigate. There are skeletons everywhere, of people who seem to have been caught off-guard by something. In the atrium I see tables toppled over, presumably used as makeshift cover, and security officers lying dead, weapons at their sides. Blast marks cover the walls. Spiffyskytrooper clearly has a knack for environmental storytelling. As I study these grim scenes, I find myself piecing a story together, trying to figure out what happened. Then the eerie silence is interrupted: a horde of ghouls wearing Vault 117 jumpsuits comes tumbling out of the darkness. Luckily I brought a sawn-off shotgun, but it’s still a tough fight. There are lots of them, and the low light means I’m not sure where they’re coming from. A lot of the Vaults in Fallout feel a little too small, not really selling the idea that entire communities were supposed to have lived in them. This makes the sprawling Vault 117, which is broken up into several large areas, particularly impressive. It really does feel like an underground city, with a logical layout and a large residential area that I spent a good 40 minutes exploring every corner of. In the residential district I find clues about what might have happened to the Vault, but I appreciate how Spiffyskytrooper shows restraint when it comes to storytelling. Nothing is spelled out, giving your imagination some room to play. At the end of a corridor I see a strange glow, only to discover a gruesome fungus growing over the walls, almost as if it’s eating the Vault. The Vault is crawling with ghouls, which I have to admit gets tedious at times. Some enemy variety would have been welcome. The Vault’s size can work against it, too, with a lot of empty rooms that would have benefited from some additional decoration or loot to scavenge. But overall The Lost Vault is a very well-made mod, and if you told me it was a part of the main game, I’d have probably believed you. Mods for Bethesda games often take things to extremes, such is the temptation of such a powerful suite of editing tools. But I love The Lost Vault because it succeeds in blending in with the rest of Fallout 4. Spiffyskytrooper has constructed the Vault with the same design philosophy as Bethesda, staying true to the style of the game, and that makes it stand out from the crowd. The Vault ends with a boss fight that, while difficult, does at least give you a break from the onslaught of ghouls. There are a few chests containing a selection of randomly-generated loot, but I would have liked a special weapon or something else relating to the story of the Vault as a memento, and as a reward for getting through it. But as an effective horror experience and a quality dungeon, The Lost Vault is worth exploring. Check out our favourite Fallout 4 mods for more ways to expand Bethesda's epic.